Of all the apps that I try and evaluate every week, there is one category that I can’t stop testing: calendar and reminder clients. I’m always looking for the perfect blend of events and todos in a logical presentation that makes sense for how I organize my day, with support for features like natural language input and custom repeats as well as more advanced functionalities such as URL schemes and app integrations. For this reason, I couldn’t say no to Readdle when they asked me to test Calendars 5, their new Universal app available today on the App Store. Calendars 5 is the successor to Readdle’s popular Calendars+, and it’s sold as a new app at $4.99. Calendars+ was a Google Calendar client for the iPhone and iPad that supported events and tasks, had a clean interface with bright color blocks, and used iOS’ native calendar UI for adding and managing events. It was a solid app, albeit obviously skewed towards Google Calendar. Calendars 5 builds upon Calendars+ by keeping the same basic layout structure and adding local calendar and Reminders integration to the existing Google Calendar support. I use both iCloud calendars and Reminders on a daily basis, so I was curious to see how Calendars 5 stacked up to my favorite solutions on the iPhone and iPad: Fantastical, Agenda, and Week Calendar HD. First and foremost, Calendars 5 is an iOS 6 app, but it’s been redesigned to match the upcoming iOS 7 aesthetic. Gone are blue toolbars and textured menus, leaving room for whitespace, white modal popups, blue highlights, and even brighter blocks of colors for events. On the iPhone, the top navigation bar – where you’ll find the usual shortcuts for different calendar views – blends perfectly with the light gray status bar of iOS 7; on my iPad with iOS 6, the status bar is a standard black, but the app is equally minimal and deferential. 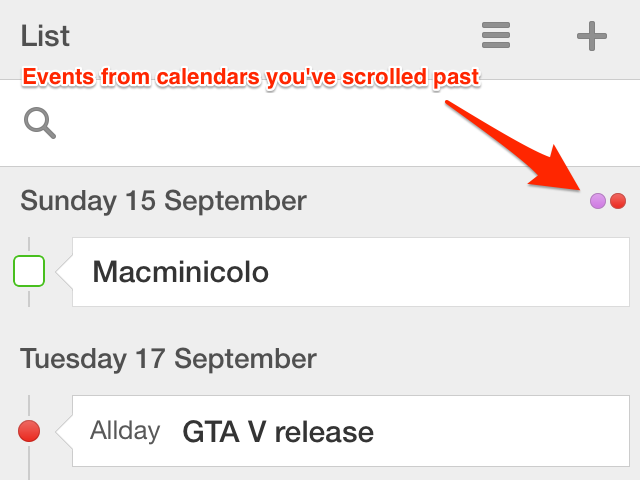 Calendars 5 focuses on lists and events rather than pretty UI chrome and pixels, and I think that’s a good decision. On the iPad, tabs to switch between Tasks, Day, Week, Month, and Year views are always visible at the top of the screen, with a scrollable menu at the bottom to quickly advance to the next day/week/month; on the iPhone, tabs are hidden by a hamburger button in the upper right corner, and the app comes with an additional List view that provides a useful summary of events and reminders unified in a single list. Both on the iPhone and iPad, you can also swipe horizontally to advance to the next day/week/month without having to use the scroller at the bottom. In any view, you can tap the top toolbar (not the status bar) to jump back to the current day, week, or month. I am a big fan of the iPhone’s List view, as it is, by far, the best way I’ve come across to quickly see all upcoming events and reminders on iOS. 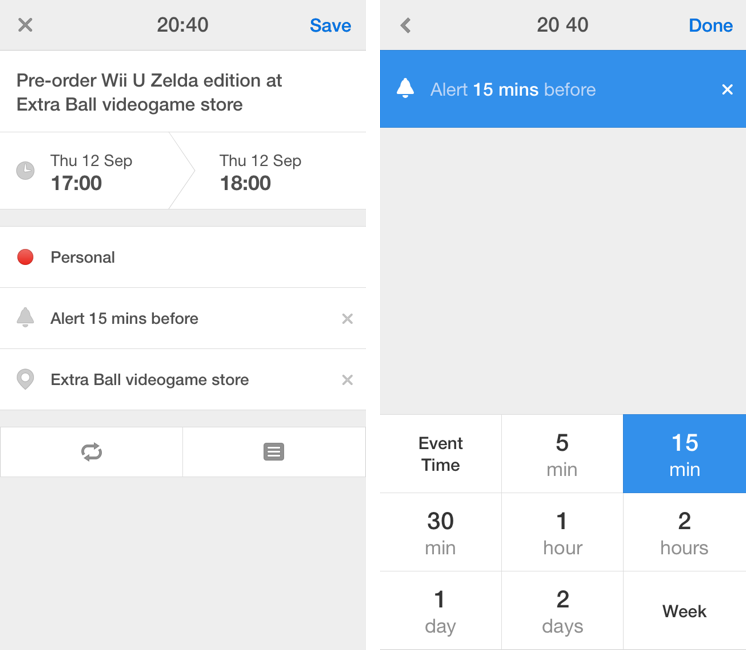 Events and reminders are listed chronologically as floating boxes arranged vertically on screen in a timeline view that shows colored dots for events and colored checkboxes for reminders. As you can guess, colors are fetched from the local Calendar and Reminders apps and they sync with iCloud. On the iPhone, List is my default view as I like how it allows me to easily see what I have to do on a specific day at a glance – if I don’t have anything to do “today”, I can scroll down and see more upcoming events and reminders, also grouped by day. On the iPad, the List view is called Day, which shows a list on the left side of the screen plus a timeline of the current day’s on the right. The change makes sense considering the iPad’s larger screen, and you can swipe on the day’s panel to move between days. My favorite detail of the List view is how, when scrolling, events or reminders that aren’t shown on a day’s list don’t completely disappear out of view: instead, Calendars puts colored dots next to a day’s header, so you can understand if you’ve scrolled past calendar items. I wish that Calendars used dots and checkboxes to differentiate between all events and reminders, but, otherwise, it’s a sweet implementation that works nicely with the day scroller at the bottom, which moves between days as you scroll in the main list. The list view has a search bar to filter items, and reminders can be completed right from Calendars without having to switch to Apple’s Reminders app. However, like Agenda, the app can’t hide completed reminders – an option that I’d very much prefer to the current design. For events, I would like to see start and end times in the list (Calendars only shows start times). Tapping on an existing event or reminder reveals Calendars' new design for event details that eschews Apple’s default layout of the built-in Calendar app. Fields for an event’s detail span the entire width of the screen on the iPhone, displaying custom date, time, and location pickers with a white keypad. In these full-screen views, Readdle decided to hide the status bar but still show the current time in the top toolbar; at first, I was confused as I thought that time indicated the due time for an event or reminder, but when I realized that it was actually the system clock, displayed to provide context in full-screen, I thought that was a nice touch. I like the animations and custom designs and I’m especially a fan of the custom repeat option: Calendars has pre-defined settings for daily/weekly/monthly/yearly repeats, but in the Custom section you’ll be able to create your own personalized repeat by combining various pieces together and achieving complex settings such as “every 2 weeks on Tuesday and Friday” or “every 3 months on the second and third Thursday”. Additionally, you can create your own end setting for repeats, choosing from “endlessly”, “till date” and “number of times”. This works for both events and reminders, and it’s a powerful feature that puts Calendars alongside Week Calendar in the group of apps that support advanced custom repeat patterns. On the iPad, events don’t open in full-screen when tapped: like Apple’s Calendar, a popup is first shown with a summary of an event’s details, and then, upon hitting an Edit button, a modal view comes up, displaying the same options of the iPhone version. Calendars for iPad shows custom date and time pickers as well, but, unlike the iPhone, they’re modelled after the iOS 6’s keyboard as they’re not white and definitely not iOS 7-like. They’re still useful, but they stick out a bit too much considering the rest of the app’s interface. One of Calendars’ most notable new features is natural language support for event creation. Ever since Fantastical for iPhone showed how it was possible to add new calendar events through human-readable commands such as “Meeting in 2 hours” or “Conference call tomorrow from 5 to 6”, I haven’t been able to go back to apps that required me to manually click and select menus to set information related to dates, times, and locations. With Fantastical, I can open the app – or trigger it from other apps like Agenda and Drafts – and type natural phrases to have the app automatically parse them and turn them into proper data fields for my calendar. Calendars 5 has now this feature as well. The way Calendars 5 displays natural language processing is heavily influenced by Fantastical’s beautiful animation: when you type and the app recognizes pieces of text that it can parse (such as “tomorrow” or “from 2 to 4 pm”), the text flies off the input field and onto a detail screen below. The difference is that Calendars’ animation is less polished than Fantastical’s, and recognized items appear and disappear on screen rather than filling a mini calendar view. The set of natural language commands supported by Calendars is mostly comparable to Fantastical’s one. I would need direct access to the full dictionary of queries of the apps to run an objective comparison, but, based on my tests, my impression is that Fantastical handles recognition of morning/evening times better whereas Calendars is more flexible for custom repeats. Something like “Meeting at office every 2nd tuesday every 2 months” will work in Calendars but not in Fantastical. Similarly, adding “Meeting on last tuesday of each month” won’t properly set repeats in Fantastical, but it’ll do so in Calendars. In daily usage, I don’t think you’ll ever notice substantial differences between Fantastical and Calendars in terms of natural language input for “simple events”, but, for recurring events with precise settings, Calendars will have a clear advantage. 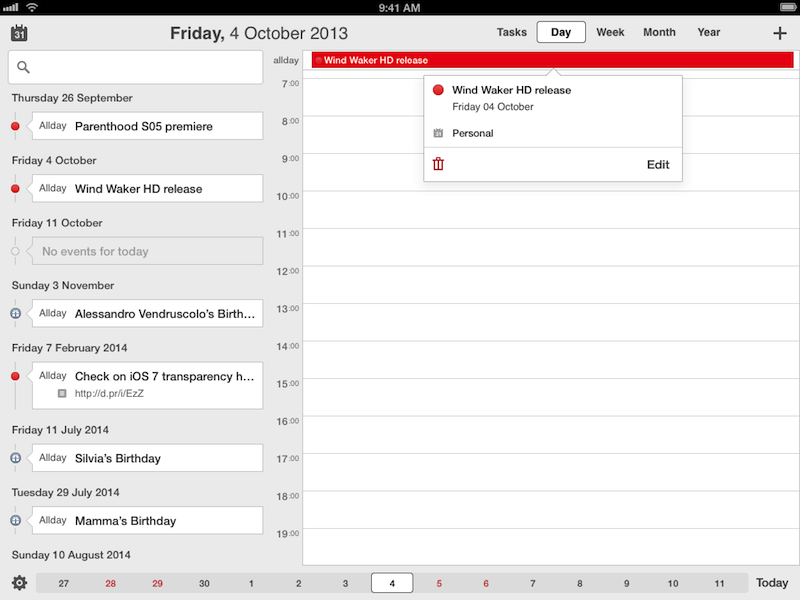 More importantly, Calendars is a Universal app, while Fantastical is still iPhone-only. Where [[text here]]is the percent-encoded text of the event you want to add. This is a nice improvement over Calendars+, but I have noticed a bug that will turn all text received via URL scheme to lowercase. From a URL scheme’s perspective, Fantastical is much more powerful and versatile thanks to its support for x-callback-url, which Calendars doesn’t integrate with. Having recently switched to Reminders as my todo management system, I was eager to try out Calendars’ new native integration in the Tasks view. Long story short: Calendars 5 can be a full-featured Reminders replacement for the iPhone and iPad, but I don’t understand some decisions behind it and I’m experiencing bugs that I don’t know if should be ascribed to Readdle or Apple’s iCloud sync. The Tasks view – which will only work with Reminders if you grant Calendars access to them – displays your Reminders lists and a + button to create a new list. You can edit a list’s name and color, tap it to view tasks inside it, and tap tasks to check them off and complete them or edit them. So far, this is pretty much a replica of Apple’s Reminders app for iOS 6, with a cleaner UI. At the top of the Tasks view, Calendars has shortcuts for Inbox, Today, Upcoming, Completed, and All tasks. At first, I thought that these would be filters specific to Calendars: the app would look into my reminders, and automatically categorize them and sort them. But as I discovered after much confusion, only Upcoming and All are local views: Inbox, Today, and Completed are actual Reminders lists that will be synced to Apple’s app. And because Completed already exists in Reminders by default, Inbox and Today are the Reminders lists that Calendars will attempt to create from scratch. There’s more. If Today and Inbox are empty, they won’t be displayed as lists in Reminders (and therefore iCloud): add tasks to them, and they will be recreated in Reminders every time. And one last absurd choice: Today will be synced as a list to iCloud, but it doesn’t work as a list because it’s a filter that automatically tags reminders with “@today” in the note field and only displays reminders in Calendars. I hear you. Everything is really confusing if you plan to use Calendars alongside Reminders on your Mac and iCloud.com, so allow me to explain my understanding of Readdle’s implementation. Your Reminders lists will sync normally to Calendars. 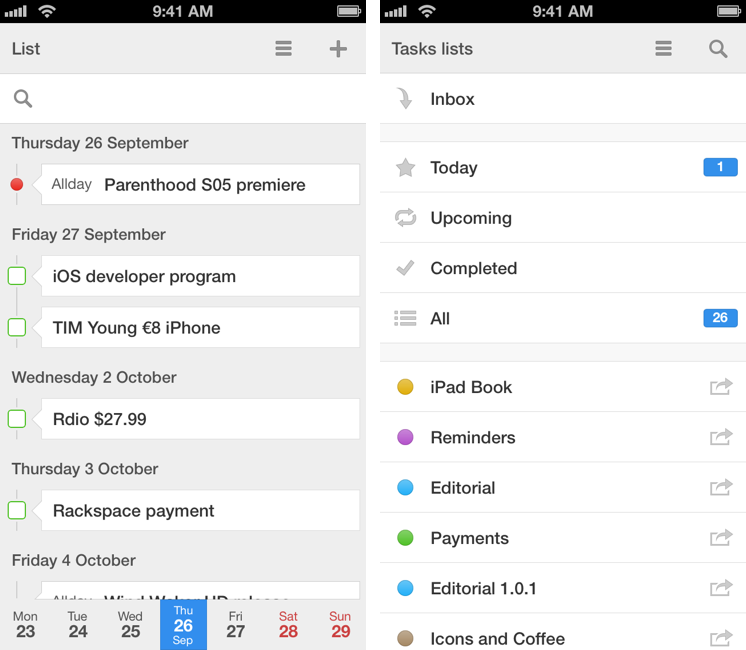 Upcoming will lists all your upcoming reminders from every list, and it’s very useful for that. All will show all tasks, grouped by list, and Completed will display all completed tasks in reverse chronological order. This is the easy part, and it (mostly) works. 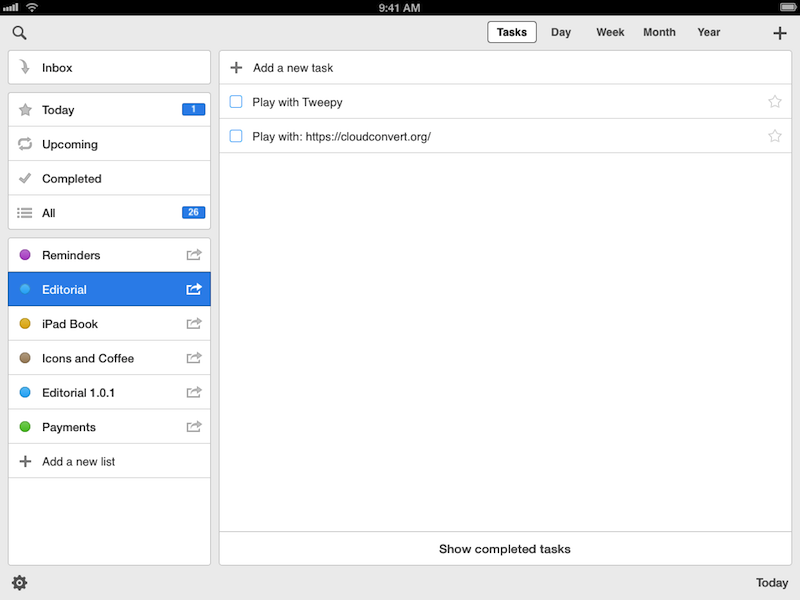 The Inbox is another “real” list that Readdle sees as the place where you go to quickly jot down new tasks. It won’t appear in iCloud if it’s empty, and it’s treated differently than other lists in Calendars in that it’s got a fancy custom icon instead of a colored circle. My problem is the Today “list”. 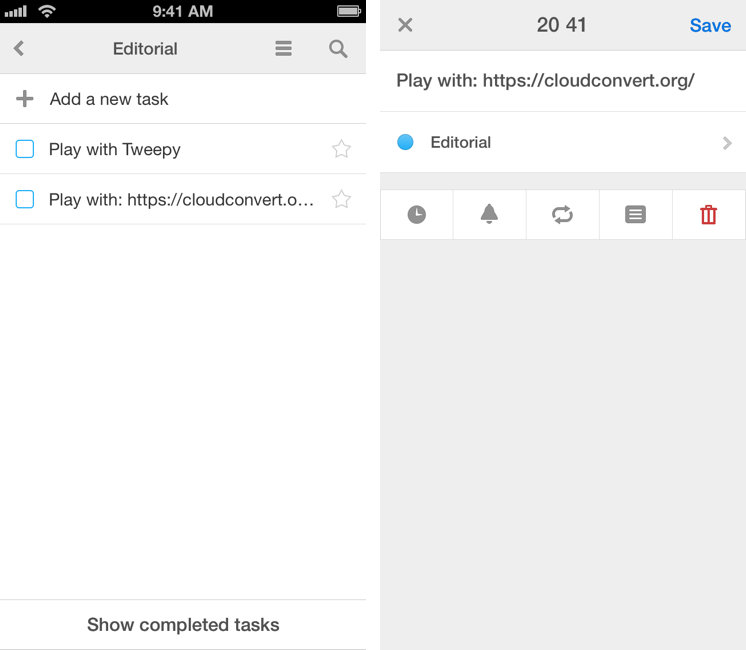 From what I can guess, Readdle wanted a way to let users see tasks due on the current day and so, rather than creating an app-specific filter, they resorted to creating a list in iCloud and keeping it empty. I have no idea as to why the iCloud list workaround was needed, but I imagine it was the easiest way to keep the Today view in sync across devices by piggybacking off Reminders’ existing sync mechanism. The confusing part arises when you move an item to Today and you think that it’ll be placed in iCloud, into the Today list, and automatically assigned a due date for the current day. It won’t. Instead, the item will be starred with a blue starred icon and auto-tagged with “@today” in the note field but kept in a list it already belongs to…unless you explicitly create a new task inside the Today list. In that case, the Today list in iCloud will display all tasks due “today” in Calendars, but only show the one created manually on iCloud (an thus your Mac or web browser). Yep. I feel like Readdle missed an opportunity to enhance Reminders’ presentation while keeping everything simple and straightforward. The Inbox is unnecessary in my opinion, and the trick of using Today as a list but also as a filter is confusing and useless in how it automatically adds “@today” to a reminder. iCloud doesn’t know what to make of “@today”, and it only appears to be of any use in Calendars, which is a poor excuse for automatically adding it to reminders stored in iCloud. Get rid of the Inbox, or at least make it optional. Turn the Today view into a filter, effectively like the Upcoming view, but only for tasks due on the current day. Stop auto-tagging through the “@today” note. Rather, to quickly assign an item to the current day, provide a shortcut that changes the reminder’s due date to the current day, with a default due time set by the user in the Settings. Right now, it’s not possible to change the default due time for reminders, and reminders created with Calendars won’t respect iCloud’s “Remind Me On A Day” setting. Add a quick entry field at the top of the Tasks view to quickly add a reminder to a default list. Add support for reminder creation to the URL scheme and allow users to switch between event and reminder creation with natural language input from the same compose panel. Add a setting to hide completed reminders. Aside from questionable decisions in the direct integration with Reminders, sync itself has been spotty for me, though I don’t know if I should think the issue lies in Calendars or iCloud itself. Sometimes, new reminders added from Calendars don’t sync from my iPhone to my iPad, or my iPad to my Mac; other times, reminders completed on one device don’t show up as completed in Calendars, and vice versa. I tend to believe that, in my case, my devices simply aren’t working well with iCloud – which wouldn’t be surprising. There are many things that Readdle got right with its Reminders integration, such as the way items are unified in the List/Day view or how you can swipe any task to mark it as complete. However, some choices in the reminder management and creation processes are puzzling: basic features such as due dates should be identical to Apple’s implementation, and the Today view is utterly confusing and fragmented. 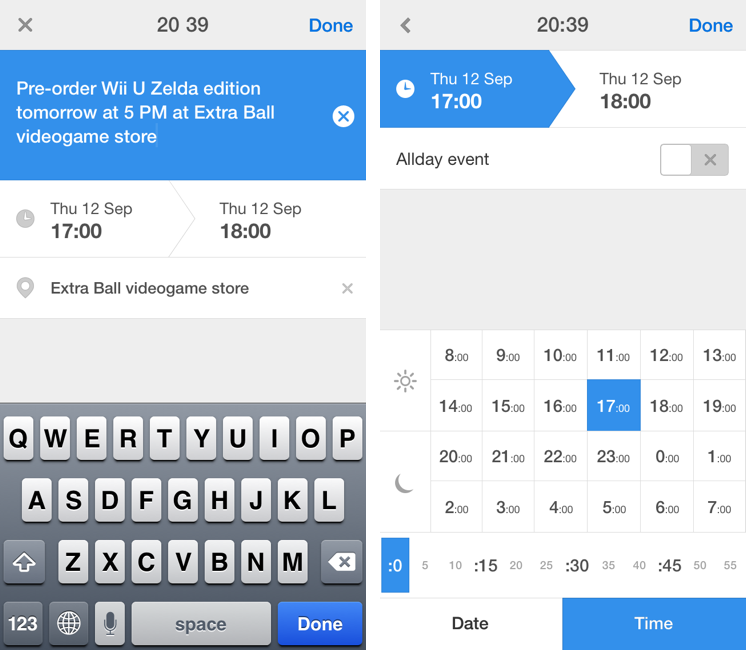 Other additions, such as support for drag & drop between lists (on the iPhone too) and search prove that Readdle did think about the details, but made some wrong assumptions for date and list handling. I thought my review of Calendars 5 was going to be short, but I ended up analyzing smaller details because, with so many calendar apps out there, I feel those are the aspects that make a difference for me. Calendars looks good, integrates with iOS calendars and reminders, is responsive, and intelligently unifies events and tasks. The app is packed with nice and thoughtful touches for event browsing and management, and the addition of natural language input is welcome. Calendars has the best combination of natural language and recurring settings I’ve seen on iOS to date, and that’s a big plus in my opinion. Drag & drop, search, gestures, and a URL scheme are the proverbial icing on the cake that sweetens the deal. Calendars needs clearer and simpler Reminders integration and support for external browsers. From this standpoint, Agenda is far superior: Savvy Apps’ client displays exactly the same reminders I have in iCloud (with no list or date artifacts) and it comes with a rich selection of external apps to open web and map links. Calendars can’t even recognize URLs attached to notes (annoying for me with Reminders) and I haven’t found a way to open URLs in a web browser (besides manually copying and pasting them). But, on the other hand, Agenda doesn’t have an iPad app and it can’t complete Reminders or display them in a dedicated list like Calendars does. On my iPad, Calendars is on my Home screen. I haven’t found any other iPad Calendar app that integrates events and reminders in a single package that also happens to be a well designed client with natural language support. On the iPhone, my preference is more nuanced: I like Calendars’ List and Upcoming views, but the app doesn’t have the powerful app integrations of Agenda or Fantastical’s polish in the event creation animation or the beautiful DayTicker (which remains one of my favorites pieces of iPhone UI ever made alongside the original pull to refresh, Tweetbot tabs, and Chrome pages). …That is, without trying to imagine all the more forward-looking features calendars could have, but that I don’t think third-party developers could fix on app-level. Calendars gets close to being my ideal app for the current state of calendar and Reminders clients. It looks good and it’s powerful, but it lacks some of the more niche features of Agenda and Fantastical and it needs improvements for Reminders. Overall, it’s solid calendar and reminder client and my favorite option on the iPad right now. Calendars 5 is available on the App Store. Federico is the founder and Editor-in-Chief of MacStories, where he writes about Apple with a focus on apps, developers, and iOS productivity. He founded MacStories in April 2009 and has been writing about Apple since. Federico is also the co-host of AppStories, a weekly podcast exploring the world of apps. He can also be found on his three other podcasts on Relay FM – Connected, Canvas, and Remaster.